List of schools to bring in the wild blueberry is at fifteen and counting. Wild Blueberry industry program helping to increase demand. Study shows flavonoid-rich Wild Blueberries positively impact mood in young adults and children. Should You Eat Wild Foods? “Wild” foods bring to mind the words sustainable, powerful, real, indigenous and healthy. Health and nutrition expert Frances Largeman-Roth explores what makes wild foods incredibly healthy and outlines how they are different from their cultivated counterparts. 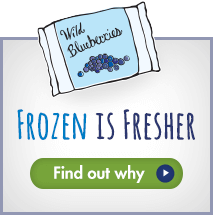 Wild Blueberries provide the perfect purple hue for delicious and all natural food dyes. Author Jessica Cording, MS, RD, CDN, celebrates American Heart Month with a ton of tasty, healthy recipes from registered dietitians. Several recipes – like Wild Blueberry Turmeric Zinger Smoothie, Berry Almond Cocoa Smoothie, Ricotta Berry Oatmeal Cups – feature frozen Wild Blueberries!